H.M. Meingast and Sons Ltd. The company's founder was born in Ebelsberg (now a part of Linz), Austria, on June 28, 1911. After World War 1, he and his family moved to Munich, where he remained until the mid-1930s. 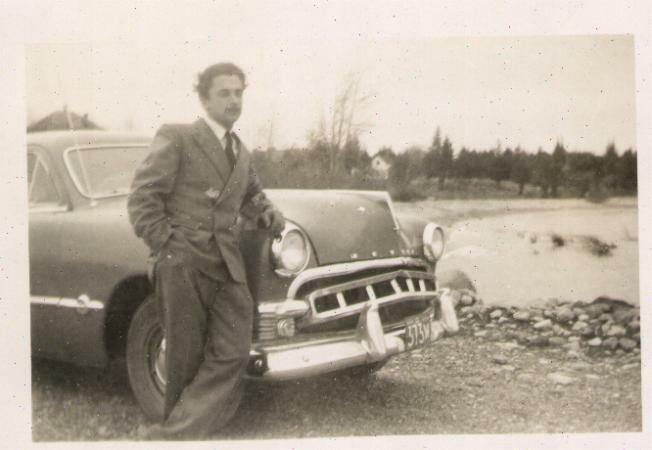 After practical and intensive training to become an engineer, he started doing research and working for the Borgward company in Bremen. Before, during, and after the Second World War, he was the chief metallurgical engineer of the Carl F.W. Borgward Automobile Company (Carl F.W. Borgward GmbH Automobil und Motorenwerke) in Bremen, Germany. Hubert was a Dipl. Ing. (Canadian equivalent MSc degree. 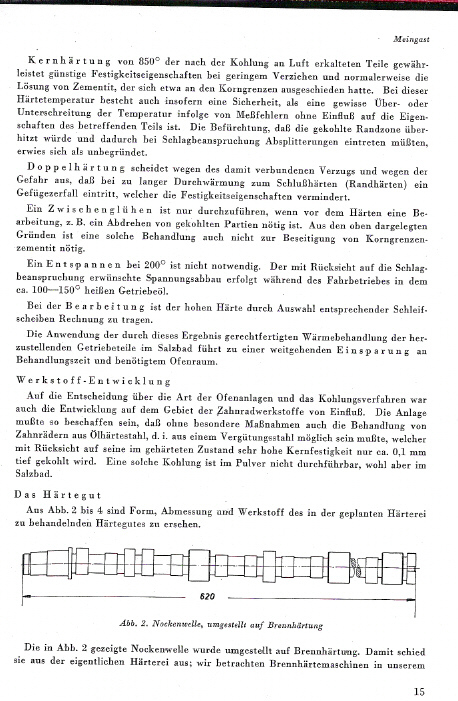 Go here for an explanation of this German degree: Dipl. Ing. Degree) The picture at left shows Ing. 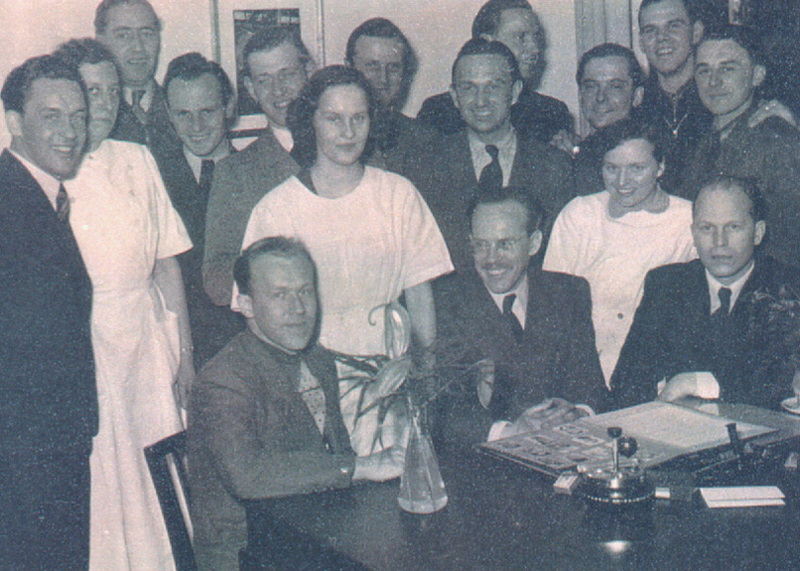 Meingast with his "team" of scientists at Borgward in 1952 (Hadi Meingast (1934-present) is shown standing at front and to the left of Hubert, who is seated at his desk in his office.). Bremen author Peter Kurze has written a number of books about Borgward in the 1950s and 1960s. View some of his titles here. Another web site you can visit for information about Borgward vehicles is here. Borgward was the 4th largest auto company in Germany [after Mercedes, Audi, and Opel(German Ford)] and during World War 2 they manufactured artillery tractors/halftracks (Sonderkraftfahrzeug), which were used to transport troops and tow the famous 88 mm artillery gun, radio-controlled demolition devices (Goliath) , and Wanze (Bedbug) light tanks (Borgward B IV Ausführung) for the German Army (Heer). For the German Navy (Kriegsmarine), they made torpedoes and they worked on the prototype for the Seeteufel (Sea Devil) midget submarine in 1944-45, but the war ended before they were put into production. For the Luftwaffe, they built bomb release mechanisms. You can view pictures of some of the trucks Borgward manufactured here (Borgward) and here (Hansa). Regarding the demolition vehicles, more information has come to light about these machines. You can read a very detailed article from AFV NEWS. Unfortunately, and to the company's everlasting shame, Borgward used Soviet prisoners of war as slave labourers from autumn 1942 in the Sebaldsbrücker factory (36% of the 8,000 workers) and in August 1944 about a 1,000 concentration camp inmates from KZ Neuengamme were used as slave workers in factories. This was not unusual as Borgward was involved in essential war production. And Dr. Borgward was designated as a "Wehrwirtschaftsführer" (military-industrial leader) by Hitler. Since Herr Doktor Borgward joined the NSDAP in 1938 in order to gain business contracts from the National Socialist government, it can be said that there was a price to be paid for doing a deal with the devil, so to speak. Very unfortunate and there is no excuse for the use of slave labourers during the war. As far as I know, my grandfather wasn't a member of the National Socialist Party. He spoke fluent Russian (as well as English and other languages) and learned folk songs and to play the balalaika from the Soviet POWs working in the factory. Also during the war, he was arrested by the Gestapo (Geheime Staatspolizei) for a short time and then released. I do not know as yet why or when this happened. This is Ing. 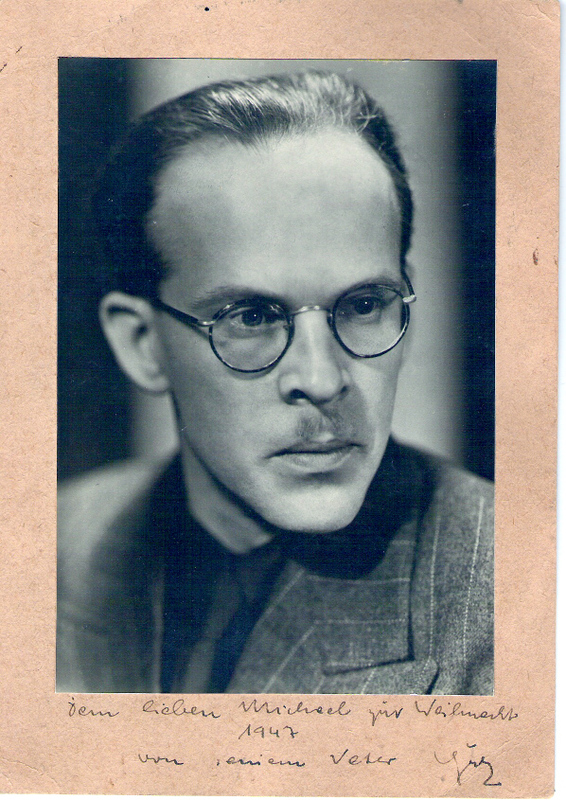 Meingast in 1944. 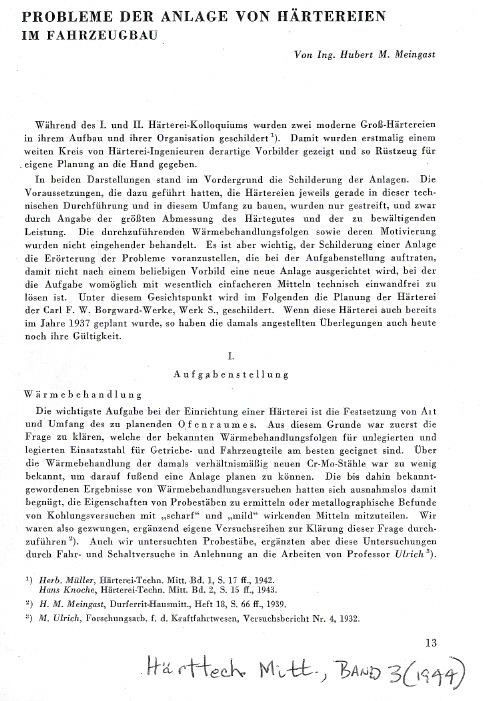 Hubert was also a research scientist who wrote academic papers concerning metallurgy and its industrial applications. He aided Prof. Dr. Paul Riebensahm in founding a satellite branch of the Institute for Materials Science of the Technical University of Berlin, in Bremen, in 1941, AWT - Arbeitsgemeinschaft Wärmebehandlung und Werkstofftechnik e.V. (Association for Heat Treatment and Material Science). 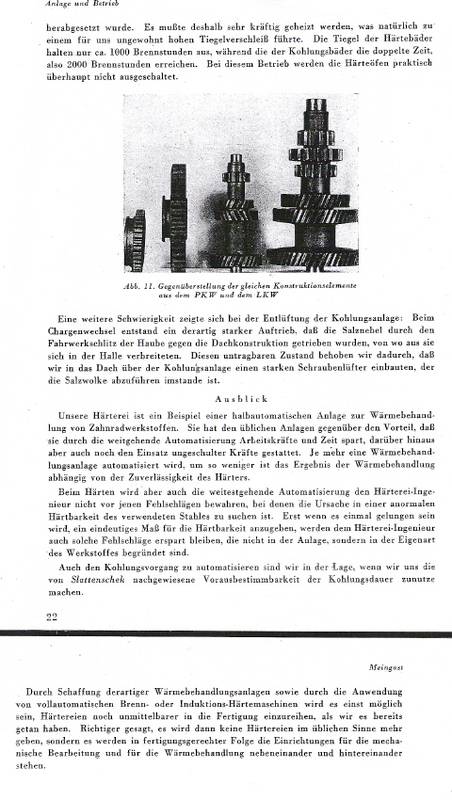 He was also later involved with a more technical off-shoot of the AWT called the IWT - Stiftung Institut für Werkstofftechnik (Institute for Material Science). 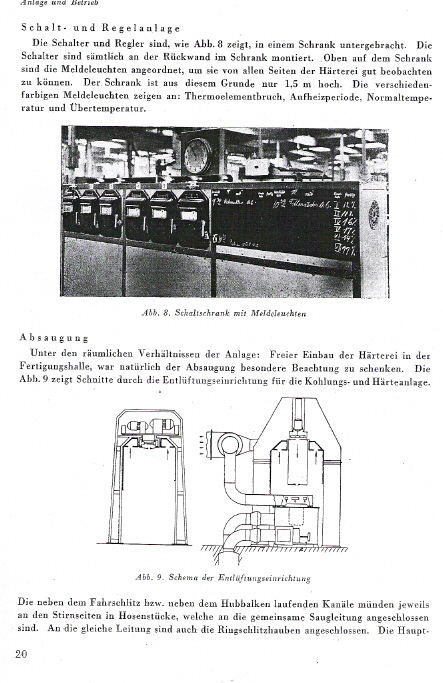 You can read a short overview and history of IWT at: http://www.iwt-bremen.de/de/iwt-im-ueberblick.html. 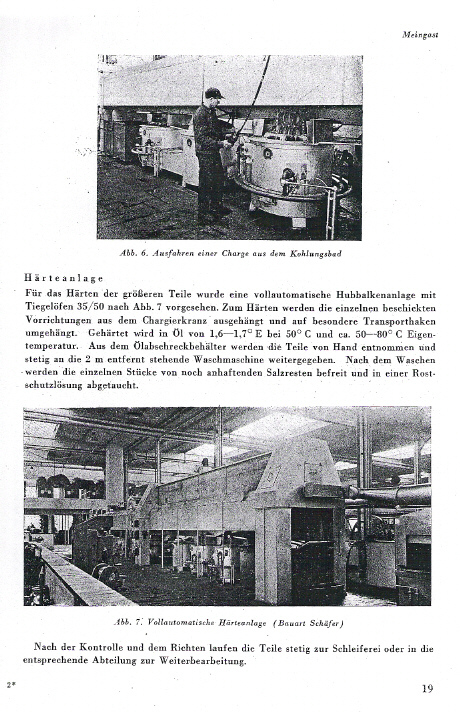 And a history of the AWT (in German) here: AWT-Chronik.pdf. 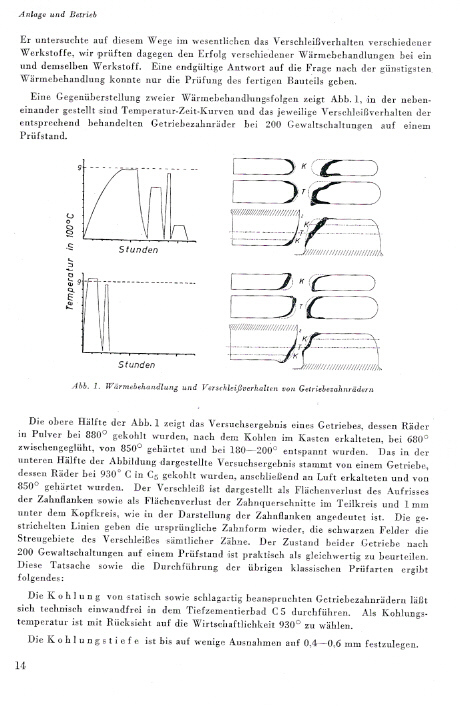 One research paper Meingast authored was described as containing ideas that were still being referred to by engineers 20 years later at the time of his death in 1961 (Ein Vortrag, der ein aussergewohnliches Interesse fand und dessen Abdruck auch heute noch, fast 20 Jahre spater, fur viele Leser wichtige Hinweise enthalt). 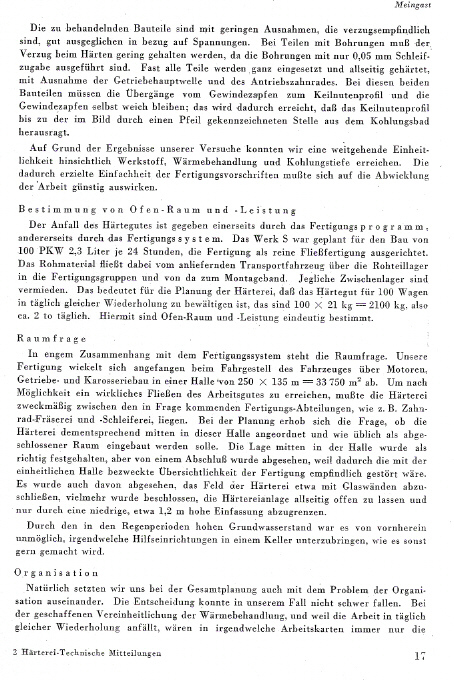 His ideas have been described as being very advanced for their time (Seine Ideen, seine Vorschlage waren oft erheblich ihrer Zeit vor-aus, seine Arbeiten – besonders aus den Jahren 1942 bis 1950 – zum Teil bahnbrechend. ), especially between 1942 and 1950. 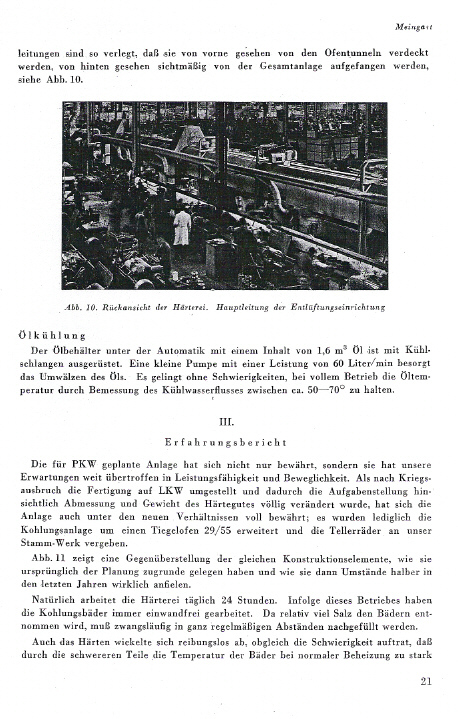 I have most of the research articles my grandfather wrote and one example "Probleme der Anlage von Härtereien im Fahrzeugbau," Härterei-Technische Mitteilungen, Band 3 (1944), is here. The rest of this important and groundbreaking research article is here: Page 2, Page 3, Page 4, Page 5, Page 6, Page 7, Page 8, Page 9, Page 10. It appears Mr. Meingast came to Canada alone in August 1952. 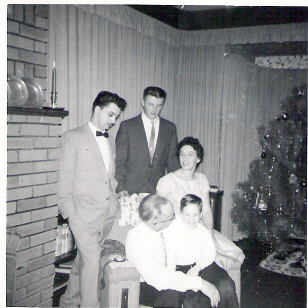 In October 1954, he brought his wife Maria Alice (nee Ott) and children to Canada. This is the liner they arrived on. With him he brought his family: his wife Maria Alice (Dorit); three daughters, Hadmute, Dagmar, and Karin; and two sons, Udo and Michael. A third son, George, was born in Canada in 1955. The family settled in Thornbury, Ontario. Here are the kids in Thornbury in 1954 in the picture below. 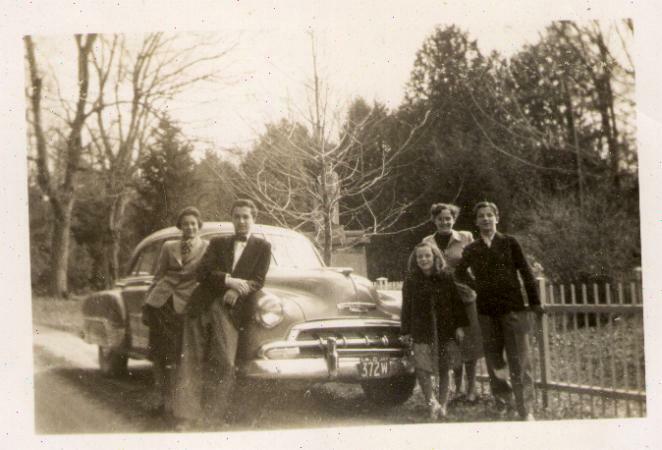 left to right: Karin, Udo, Dagmar, Hadi, Michael all standing by their father's 1952 Chevrolet. You can also view a copy of Mr. Meingast's Canada Immigration Card here. 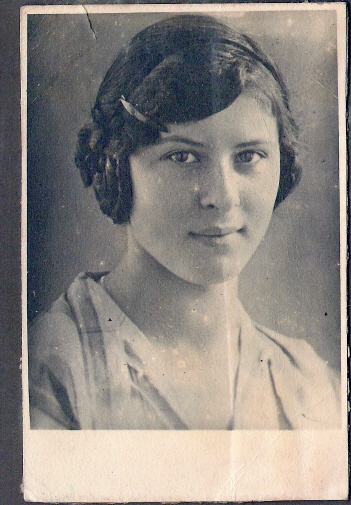 Sabine Mair, who was born in 1911 in Haar near Munich and passed away in 1935 as a result of tuberculosis. 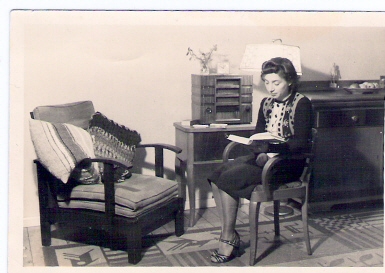 This is Hadi's mother (photo above). Hubert then met and married Maria Alice Ott (photo above). Hubert's daughter Hadi and Maria's children from a previous marriage, Karen and Udo, became a family. Sons Michael and George and daughter Dagmar came later. From after his arrival in Canada in 1952, Mr. Meingast was the plant metallurgist at the Cockshutt tractor factory in Brantford, Ontario. The following information is from the Cockshutt web site: "In 1946 Cockshutt introduced their first "built in Canada" line of farm tractors A 2 - 3 plow size tractor, Model "30". 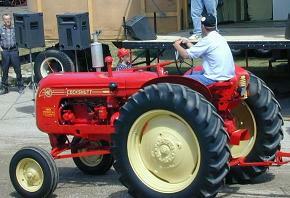 This was the first farm tractor in the world to be equipped with a revolutionary "live" power takeoff. This was a complete new system, the concept was way ahead of the much larger American firms forcing them to redesign and retool to meet the challenge of this little Canadian upstart. Although there were several early steam tractors built in Canada, Cockshutt was the only one to produce a full line of modern tractors, designed and built here continuously over some 15 years. In 1947, primarily to produce tractor castings, a one and a half million dollar foundry was added to the Brantford plant. For its day, this was state of the art European technology, surpassing anything in operation in North America. Between 1949-1951, the model '40 was introduced after nearly 3 years in development. This was all Cockshutt design and engineering. 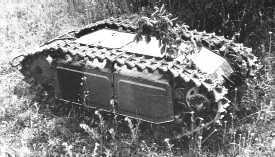 The chassis would be used as a platform for several future models. Cockshutt also entered into an agreement to manage a factory in Renfrew, Ontario for the Canadian government. The plant made deep draw turbine housings, of special heat resistant stainless steels for Orenda jet engines." In 1957, he left the Cockshutt Company to help found a new industry in Thornbury, Ontario. This company was founded by its namesake, Harold Jones, and was a manufacturer of hydraulic cylinders and custom-built mining equipment. 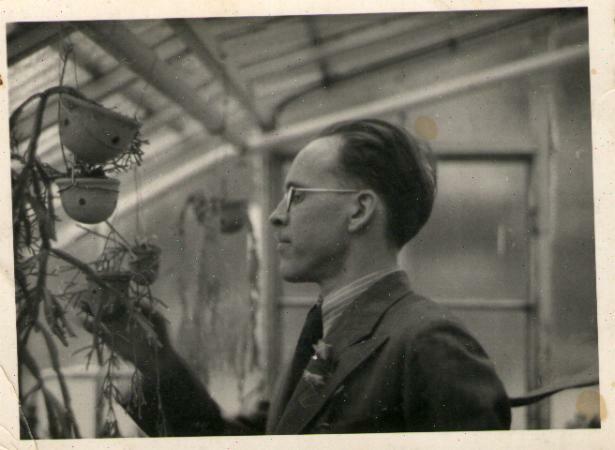 Hubert Meingast was vice-president of the company and did all the product design work. As if that were not enough, Herr Ing. Meingast also travelled to South Africa to do consulting work with the mining industry there. In 1958, Mr. Meingast became a full partner in the H. Jones Machine Company, which was subsequently renamed the J.M.G. Company (J.M.G. - Jones, Meingast, Gardner). Business had steadily expanded since the firm's founding, requiring the physical expansion of the plant and the hiring of more workers. By 1959, there was a workforce of 35 and an air strip had been built for the company's planes. The aircraft were used to fly newly manufactured equipment to mining companies in remote parts of Northern Ontario. J.M.G. eventually became Teledyne (Canada) and is now Breaker Technology Ltd. and is still in existence in Thornbury today. Still producing the same product, pretty much, as they did almost 50 years ago. 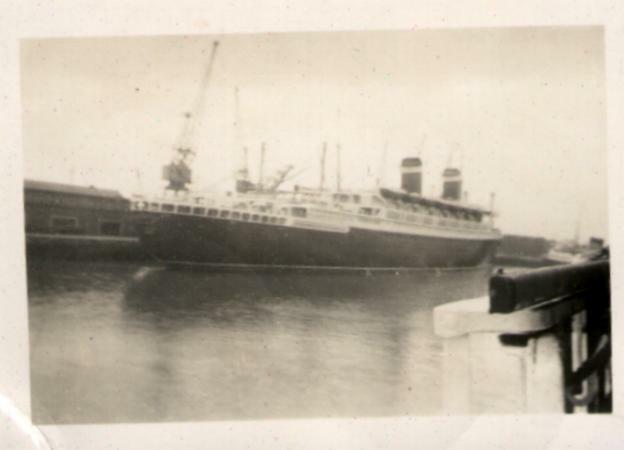 In late 1959, Hubert Meingast founded his own manufacturing company in Owen Sound. Mayor W. A. Forsyth, Alderman Burk Walsh, Irvine Brown, and City Industrial Commissioner "Mac" McKenzie had helped persuade Mr. Meingast to set up shop. Also, the fact that Black-Clawson Kennedy could provide high-quality steel was an important reason to locate in the city. The original plant was located just past the Malleable Hill on the Leith road, northeast of the city. The Hobarts Manufacturing Company was located right next door. 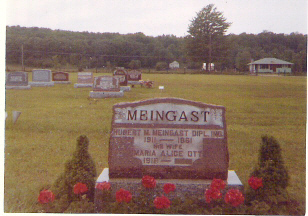 H.M. Meingast and Sons Limited started out in a 6,000 square foot building with 12 employees. The products manufactured were hydraulic cylinders and custom-built hardening machines which were sold under the trade name Candesma, which was derived from the slogan "Canadian Designed and Manufactured." Udo Meingast (1934-1987) was the plant superintendent and Michael Meingast (1937-1983) was the plant foreman. The Canadian Intellectual Property Office has one patent with Ing. 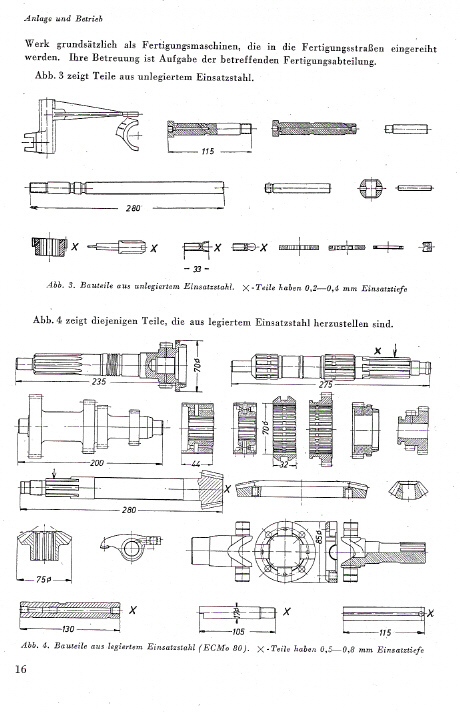 Meingast named as the inventor. Patent CA 667394 was issued for hydraulic feed leg devices both single-action and double-action. Feed legs (also known as jack legs) are used by miners to drive the drill into rock. A single-action feed leg drives the drill into rock and the miner then has to manually withdraw the drill. A double-action feed leg drives the drill into rock and then by pressing a lever on the feed leg the drill is caused to withdraw from the rock. Pictured below is a single-action feed leg in Fig. 1. 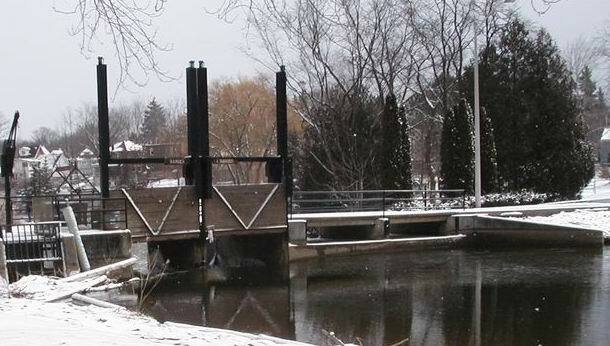 Locally, hydraulic cylinders built by Meingast Ltd. were installed at the Owen Sound Mill Dam, where the first fish ladder in Ontario was constructed in 1959 by the North Grey Conservation Authority and the Sydenham Sportsmens' Association. The cylinders were, and are, more than 40 years later, used to raise and lower the gates at the dam. There's a little rust but otherwise they are none the worse for wear. Still being operated by hydraulic hand pumps, 'though... 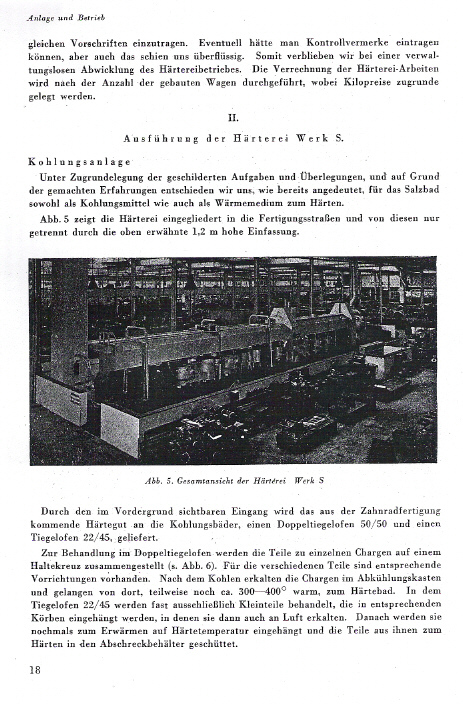 The high quality products produced by the Meingast plant ensured that the business would continue to successfully expand and by the end of 1961 the payroll stood at 17. Unfortunately, during the summer of 1961, H.M. Meingast was diagnosed with lung cancer (he was a heavy smoker). After being hospitalized for four weeks in Toronto, Mr. Meingast died on Tuesday, August 29, 1961. He was a little more than 50 years old. 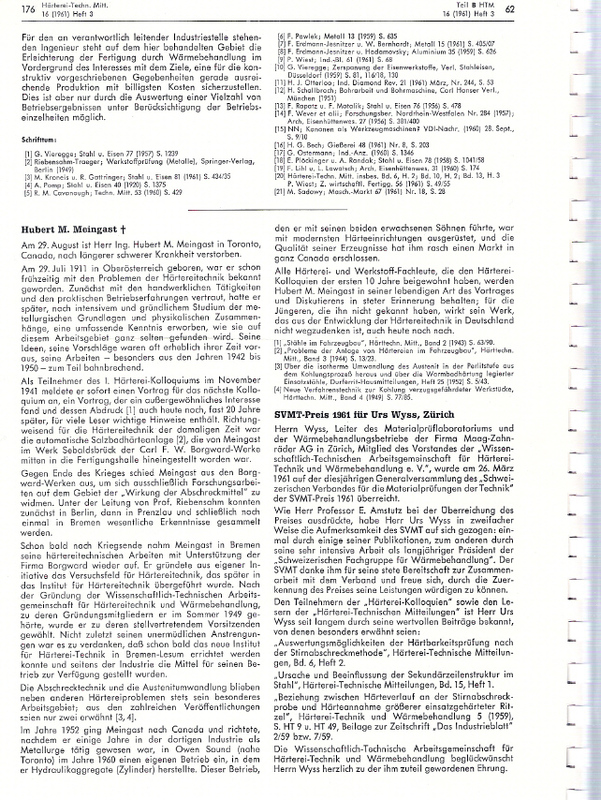 An excellent obituary was published in HTM (Härterei-Technische Mitteilungen) later in 1961. Hubert is buried in Greenwood Cemetery in Owen Sound (Location: G-Greenwood Gardens aka Songbird Vista 17A- Lot 23- 1 Meingast, Hubert, Age: 50, Burial Date: 08/31/1961, Death Date: 08/29/1961). Mike Meingast is also buried in Greenwood Cemetery. Udo Meingast is buried in the Thornbury Cemetery. After Mr. Meingast's death, his sons, Udo and Michael, carried on with the business. An engineer, A. R. Jupp, P.Eng., was hired as general manager and was able to use his wide background of engineering experience to help the company. By the end of 1962, the plant's payroll had increased to 28 employees. During 1964, an extra 5,000 square feet was added to the factory and the number of employees rose to 38 and then eventually to 50. Things were so busy at this time that there was a continual shortage of machinists and the company was offering to train workers. This corporation was, and still is, a major manufacturer of fluid system components for industrial, automotive, and aerospace applications. Corporate headquarters are in Cleveland, Ohio. In 1965, Parker-Hannifin came to Canada looking to buy. They came across H.M. Meingast and Sons Ltd. and liked what they saw. So much so that in October 1965, Parker-Hannifin made an offer to purchase, which was accepted. In April 1966, Parker-Hannifin began construction of a new 28,000 foot plant located at 1000 6th St. East, on top of the east hill in Owen Sound. This company operated in Owen Sound until 2007 manufacturing hydraulic products of high quality and employing about the same number of workers as when Meingast Ltd. was sold to Parker. It was good news for the skilled workers who made a career there and also to the city who collected taxes since 1959. I've been very casual about how I've presented my information by not citing where my data came from exactly. I didn't want this to appear too stale and academic-looking. 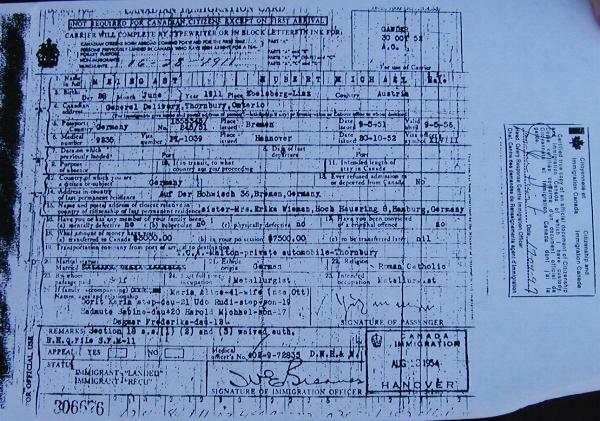 I can state that many of my sources were: Family and friends of my grandfather, personal family documents, photographs, Canadian, German and Austrian government documents, Owen Sound Sun Times newspaper, and help from German and Austrian government officials. If my information is not accurate, please feel free to let me know by e-mail (rmeingast@yahoo.com) and I will make corrections. Thanks.